Every now and then I like my outfit that much that I talk my lovely man into snapping a few candid images of it. Today was one of those days and my oh my did mother nature bring out her big guns right in time for these shots! The perfect little floral summer dress! I'm having hit after hit with floral frocks from Torrid this summer, I've never owned so much print. I've always loved floral and bright prints but I've never been sure of what suits me, now I'm swooning for prints like this. I'm wearing this in a size 12 and unlike most of the dresses I've recieved from torrid this actually fits my bust and waist perfectly. Being an hour glass I can have too much room in the waist but this is a perfect fit. The bust is sweet yet shows great cleavage and the spaghetti straps are adjustable for different size busts. The smocked back it actually nips you in at the waist but I've also added the black bow belt to accentuate my shape even more. The cardigan (size 0) is a basic but I think I'll wear this over so many tanks and little dresses. The back has a black lace panel at the back giving it a little bit more of a rock and roll edge. After the success of the last two Torrid belts I've had I gave into this adorable bow belt. It's 3 inches wide so it is thick enough to give you a great shape. The whole structure of the belt other than the bow is elastic which sadly means this is a little to large for me. This is nothing that a few stitches can't fix. I can't wait to wear this as the weather cools down as well. Pairing floral with leather biker jackets and knew high boots is my favorite Autumn style so I'm actually excited for the next two seasons! 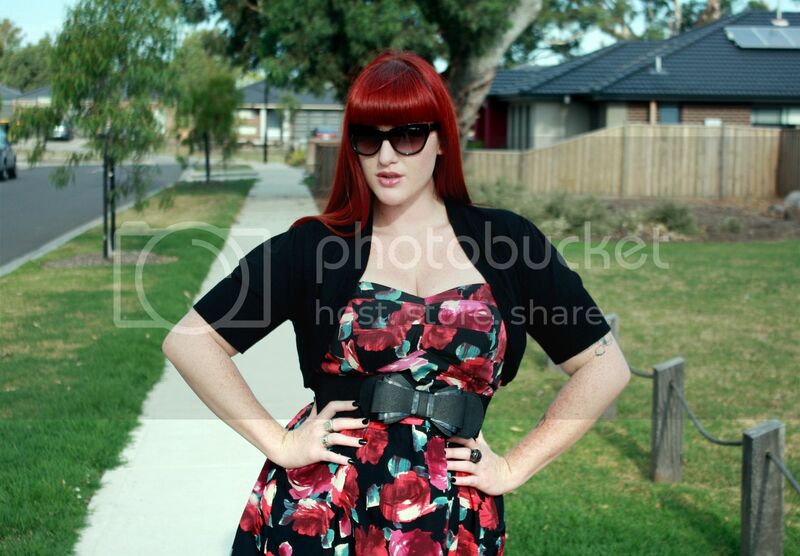 Now don't forget to enter my Torrid Giveaway for an amazing Queen of Heartz dress! Absolutely brilliant. You make spring jealous, ahhhhhhhhhhhhhh. Such a Sunday inspiration. I am followin and adding you to my blogroll this minute. Oooohhhh la la la la la la la la LA! gorgeous outfit! ranodm question: do you know a good place that sells cropped cardigans? I can only ever find them in cheapo stores and even then, not that often. This one is from torrid but other than that I love Heartbreaker and even ebay for bulk lots. loving the summery look, effortlessly stylish as always!! You look amazing as always - I wish i had killer curves like you, instead of the 12-year-old boy frame I got stuck with. But I think nipping things in at the waist with an A-line skirt might actually give me a bit of shape, so thanks for the inspiration. Jeesh. Your are just beautiful. Love everything you wore, you are a great stylist. you look fabulous in this, i want it for myself now. Does the dress have any stretch to it? whoa you look stunnin in that dress! and wow, the backdrop is friggin amazing! what a gorgeous day and you fit right in with all of that gorgeousness :D love the print on the dress i will have to look for it on torrid. So lovely! That is such a beautiful and very fashionable plus size clothing. Where did you shop for that? This is from Torrid. There is a link for all the items just bellow the image. I've seen that in the Torrid, damn cost so much to shop there. You look really good in that dress. I've found Torrid to be the complete oposite actually, in comparison to plus size and standard companies here in Australia they are cheap! W the Colours, W the FlorealSummre Dress! You look fabulous! Love the whole look.